Editor's note: this particular article involves downloading and installing software from un-trusted web site. That's dangerous. It also involves running Windows. That's also dangerous. To top it all off, it also involves software that interacts with your mobile phone at a very low level. That, too, is dangerous. In short, HiR isn't responsible if you get in trouble with the law or your service provider, get a virus from a russian s3ri4lz site, get somehow addicted to running Windows, or brick your shiny new gadget. Now for the fun stuff. One of the things I kind of relied on my Motorola e815 for was dial-up networking (DUN) via bluetooth. I didn't necessarily use it a lot, but as a sysadmin that's always been a bit of a road warrior, I often find myself places where there simply is no Internet. Inevitably, the pager-of-doom goes off and I'm out at the lake camping or at a location where there's no obvious Internet connection available. Other times, I'll be on a commuter bus and have the burning desire to check the news, or do some research on something really quick. Whatever the reason, I enjoyed this functionality. On the e815, this was simple to enable. A quick punch-of-numbers on the keypad and voila. My MacBook could see it as a bluetooth modem with surprisingly quick download speed nonetheless -- at times upwards of 1mbit/sec. The LG Chocolate? Different story. My MacBook saw it, but I wasn't getting anywhere. The connection would be refused with an invalid login and password, even though my login and password were fine when using my e815. This had me concerned. I did a quick bit of research, and found that the phone has some internal IDs that differ when used for DUN. There's no quick handset-hack for this. 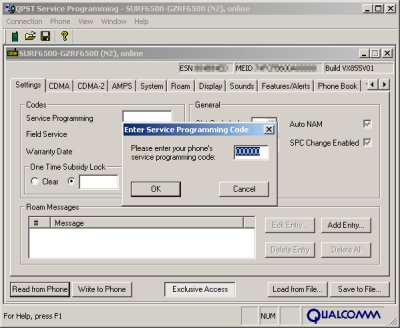 Two things were required: A Data Cable, and the proprietary software from Qualcomm (called QPST) for changing the phone's settings. Even BitPIM wouldn't help me here. All of the Windows operations were done within Parallels Desktop on a small Windows 2000 partition with all the latest patches. This isn't saying much, I don't know when the last patch was released for Windows 2000 but it's a lightweight operating system that can run the few Windows apps that I am ever tempted to launch. The first order of business was to find the software. Unfortunately, the location where I got it seems to be offline, but you'll have to search for it. The specific file I found was a compressed installer for QPST 2.7 Build 231. Other builds might work fine. I'll caution you that a lot of sites that I found contained massive amounts of shady stuff, so do this at your own risk. I scanned the downloaded file for viruses before transferring it to my Win2K virtual machine. This is only available for Windows. Once downloaded, install it. It's a pretty straight-forward next-next-next installation. Next, of course, was finding the data cable. I went ahead and purchased the Verizon Chocolate music accessory kit. It was a relative bargain at only $45. Along with the USB Data cable, I also got a special stereo 1/16" headset, a 2GB TransFlash card and adapters. The package also came with drivers for the USB connection as well as software for managing music on the phone. I obviously had no intention of using their Windows software just to copy files to my phone, but the driver was also Windows-only. I installed the USB driver, inserted the 2GB card into my phone, and went on my way with the rest of this hack. 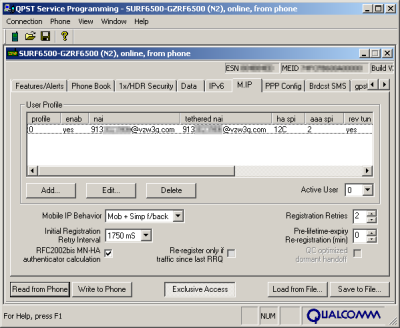 Once the drivers are installed, the phone shows up on a high COM Port. 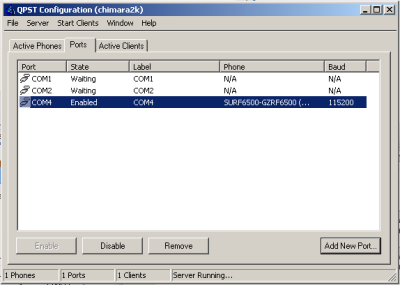 Make sure the phone is plugged in and if running Parallels (versus doing this on a dedicated Windows machine) make sure that the USB Device is enabled for Parallels (Devices > USB menu) then open QPST Configuration and hit "Add Port". If all's well, you should see your phone in the dialog. Select and add it accordingly. 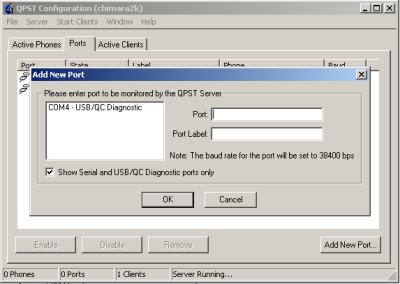 Once the port has been added, close QPST Configuration. Next, open QPST's Service Programming tool. It should immediately prompt you to select your phone. Select it and continue. BEFORE YOU DO ANYTHING AT ALL, hit "Read from Phone", enter the SP code (usually 000000) and then save the data to a file. This will back-up your phone's configuration. 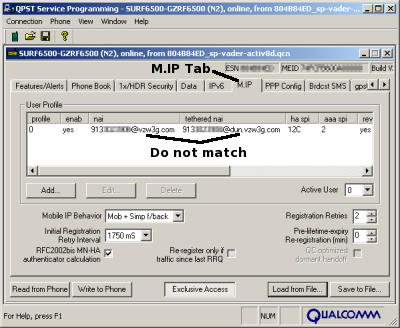 Now that that's out of the way, on the row of tabs across the top, scroll over until you find the M.IP tab. Expand the "NAI" and "Tethered NAI" columns so you can read them both clearly. You can see that Tethered NAI is not the same as NAI. Edit Tethered NAI so that it matches. Then, save this configuration to a different backup file. Don't over-write your pristine backup, please. Finally, get your phreak on and click the "Write to Phone" button and cross your fingers. Quit the QPST Service Programming tool. Your phone should reboot and be completely intact. From there, you set up your dial-up networking as usual. This is straight-forward in both Windows and Mac OS X. Now that you have the cable with a driver for Windows, you can do USB Serial or bluetooth on Windows. Without a USB Driver on OS X you can still do Bluetooth DUN. If you configured your phone's Bluetooth connection with the "Access the internet with this phone's data connection" option checked, it should simply ask for a username and password.